The DE BRUIR workshop is located in the heart of ‘The Thoroughbred County’ of Kildare. This area is renowned for breeding some of the world’s finest race horses. Since the end of the 19th century Kildare has been home to the state-run stud farm “The Irish National Stud” and hosts many other thoroughbred stud farms in the surrounding countryside. From young foals to mature race horses, leather as a material plays an integral part in the life of every horse. Local craftsmen around Kildare have been making bridles and saddles for hundreds of years to supply the thoroughbred horse industry. And within this equestrian industry, leather is considered a robust working material and used primarily for its strength, malleability and longevity. The further characteristics of luxury, texture and warmth are secondary benefits of this magnificent natural material. So Kildare, “The Home of the Horses” has had as long an affiliation to leather as it has to the horses that it breeds and races. While we don’t make bridles and saddles, the specific materials and techniques used in the construction of the DE BRUIR collection are directly influenced by these traditional crafts. The studio’s equestrian links extend to an affiliation to the prestigious Dublin Horse Show. 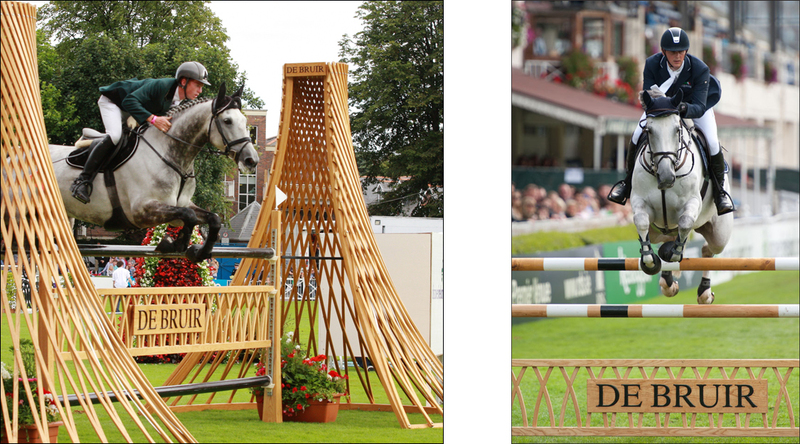 A feature showjump design made by Garvan de Bruir is in the main arena of the RDS for the Aga Khan Trophy every year. “We are delighted to have the DE BRUIR brand at the event. The signature pattern used in our ‘Racing Collection’ was used to create the Ash latticework structure of the jump”.